Follow us (GarSpecialties) on Twitter! If you haven’t joined Twitter yet, here is an idea to get you started. Twitter is a valuable marketing tool. It can help you create a social following. 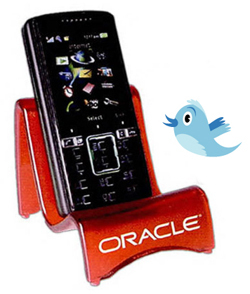 Advertise your twitter account on an imprinted product. I suggest a desktop item or a computer related item. Find something that likes to hang around the computer. That way it works as a reminder. Twitter is also mobile, you can text your tweets or download smart phone applications. A printed Electronics Lounger would be a great way to advertise and kick start your social marketing campaign. It doesn’t take much to get started, but you have to be active to be effective! Rudee November 25, 2009 Comments Off on Follow us (GarSpecialties) on Twitter!